Unless you hunt, regularly seek out game birds or frequent medieval feasts, you probably haven’t had a lot of guinea hen. But if chef Emeril Lagasse has his way, you will be eating more of it soon. With its flavorful, juicy meat, guinea hen is the perfect beginning-of-fall roast. Here, six great recipes to try. 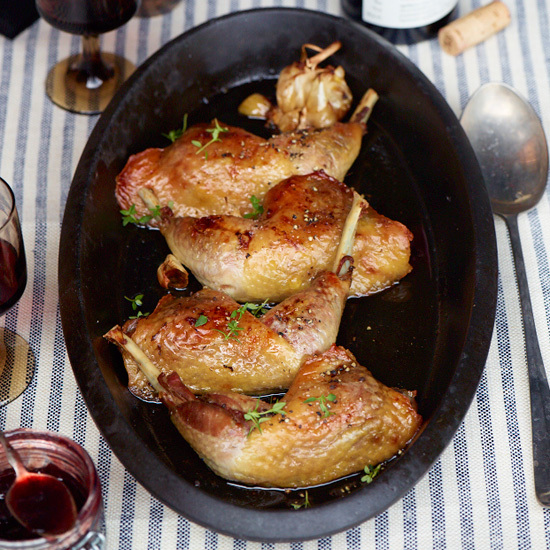 For the ultimate fowl dish, these guinea hen legs are baked in duck fat. Though the meat here is rich, it’s served on watercress with radishes and lemon wedges for a brightly balanced dish. This guinea hen is roasted on top of a ratatouille-esque mix of vegetables. Plump dried dates give this dish its richness and complexity. This crowd-pleasing recipe pairs roasted guinea hens with caramelized endives, lightly wilted dandelion greens and crisp prosciutto. A classic Burgundian dish, this roast merits a really great bottle of Pinot Noir.